Radio amateurs continue to make contributions to the state of the art in antenna design and construction. The available tools have grown in sophistication by leaps and bounds over the past years. 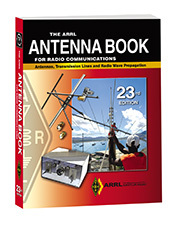 Antenna modeling with the low-cost or free programs available to amateurs has completely changed antenna design and development. A large set of antenna models designed for use with EZNEC 6.0 demo software is included. Includes all of the fully searchable text and illustrations in the printed book, plus utility programs and supplemental content from expert contributors.The CD contains the following software applications for Windows. HFTA: a ray-tracing program designed to evaluate the effect of foreground terrain on the elevation pattern of up to four multi-element HF monoband Yagis in a stack. YW: A program designed to evaluate monoband Yagi antennas. TLW: A program to evaluate and model various transmission line matching conditions. System Requirements: A fully searchable PDF version of this book is included for Windows® 7, Windows Vista®, or Windows® XP, as well as Macintosh® systems, using Adobe® Acrobat® Reader® software. The Acrobat Reader is a free download at www.adobe.com. PDF files are Linux readable. Utility programs are Windows® compatible, only. Some utilities have additional OS limitations and may not be compatible with 64-bit processors.